Starring Kumail Nanjiani, Zoe Kazan, Holly Hunter, Ray Romano, Anupam Kher, Zenobia Shroff, Adeel Akhtar, Bo Burnham, Aidy Bryant, Kurt Braunohler, Vella Lovell, Myra Lucretia Taylor, Jeremy Shamos, David Alan Grier, Ed Herbstman, Shenaz Treasurywala, Rebecca Naomi Jones, Kuhoo Verma, Mitra Jouhari, Celeste Arias, Linda Emond, Shana Solomon, Jeff Blumenkrantz and Holly Chou. Screenplay by Emily V. Gordon & Kumail Nanjiani. Distributed by Amazon Studios and Lionsgate. 119 minutes. 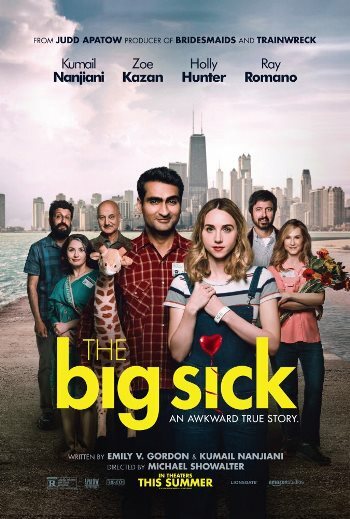 Rated R.
Well in The Big Sick, for the first half hour or so, you’re enjoying a sweet and charming romantic comedy and suddenly the film veers into much darker and dramatic territory. It doesn’t make it a worse movie per se, it’s just not what you were expecting. In some ways, it even improves the film – it certainly becomes deeper and more substantive than the funny-but-slightly-predictable early scenes. As stated before, it starts off as a pretty standard rom com. Kumail is a struggling standup comedian who is basically making a living as an Uber driver and doing as many gigs as he can. Emily (Zoe Kazan) is an adorable psych student who he meets cute when she inadvertently heckles him at one of his gigs – she shouts “woo-hoo” in appreciation, but it throws off his timing. After the gig, he approaches her to tell her off for yelling out. They end up hitting it off and spending the night together. Neither is looking for a relationship, and they swear it will be a one-time thing. But as they keep falling into bed together, they suddenly realize things are starting to get more serious. Sadly, Kumail has a secret that he has not told Emily. His parents are devout Muslims and are determined to fix him up with a nice Pakistani girl, to the point that they are almost constantly fixing him up on blind “dates” to essentially find a match for an arranged marriage. Kumail is not interested in any of these girls, but he is afraid to disappoint his parents, and worried if he were to get seriously involved in a relationship with a white girl, his parents would literally disown him. Eventually Emily stumbles upon the pictures of his little “fix-ups,” and realizing he lied to her and there is no future in the relationship, she dumps him flat. Fast forward six months. Kumail has just about gotten over Emily when he gets a call from her roommate. She has suddenly become very sick and is in the hospital. Someone has to watch over her until her parents can get into town, and she didn’t know who else to call. Kumail doesn’t want to do it, but feels obligated and goes to the hospital. When he arrives, it turns out her illness is much worse than he expected. Her doctor tells her in no uncertain terms that if he does not pretend to be her husband and okay her being put in a medically-induced coma, she may die. Kumail is horrified to have that responsibility, but eventually agrees. When Emily’s parents Beth (Holly Hunter) and Terry (Ray Romano) arrive, they know all about him and what had happened with Emily. (He had blown off an opportunity to meet them months ago when they had been in town, and as Beth explains to Kumail, Emily tells her everything.) They tell him he is no longer needed. However, Kumail keeps showing up at the hospital, eventually breaking the icy reserve of Emily’s parents. He also realizes they are having some marital problems of their own, and eventually they come to respect and even like each other as the three of them wait around to see if someone they all love will live or die. Like I said, not the normal romantic comedy after all. In fact, Kumail spends more time with Beth and Terry than he does with Emily in the film. However, it a sweet and charming story, sometimes surprisingly funny, sometimes surprisingly heartfelt. It is a very strong and assured debut film. I look forward to seeing what Kumail Nanjiani does next. Tags: Adeel Akhtar, Aidy Bryant, Anupam Kher, Bo Burnham, Celeste Arias, David Alan Grier, Ed Herbstman, Emily V. Gordon, Holly Chou, Holly Hunter, hospital, jay s jacobs, Jeff Blumenkrantz, Jeremy Shamos, judd apatow, Kuhoo Verma, Kumail Nanjiani, Kurt Braunohler, Linda Emond, Michael Showalter, Mitra Jouhari, movie review, Myra Lucretia Taylor, PopEntertainment.com, Ray romano, Rebecca Naomi Jones, Shana Solomon, Shenaz Treasurywala, Silicon Valley, The Big Sick, Vella Lovell, Zenobia Shroff, Zoe Kazan. Bookmark the permalink.